Introductory page about Rhiannon with links to key pages about her. Rhiannon is the formidable lady of the Mabinogi, who plans, actions, endures, and wins, all her desires except one. She is human, divine, fae, political, passionate, wise and funny. Rhiannon Story. First Branch, Episode 1. Rhiannon Story 2. First Branch, Episode 2. Rhiannon Story 3. Third Branch, Episode 1, 2, 3 and 6. Fourth Branch, Episode 1. Includes note on Adar Rhiannon, the Birds of Rhiannon. 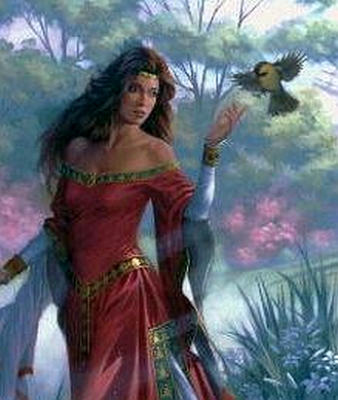 Adar Rhiannon, the Birds of Rhiannon. Rhiannon sources. Textual sources about Rhiannon.